Looking for a quick(ish) way to set your golf clubs apart from your playing partners? Re-finish them! Nothing screams individual like a unique paint job. 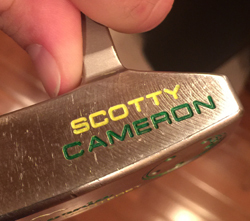 I recently sat down and turned my Scotty Cameron into a work of art. All you need is a couple of hours, patience and a handful of supplies from your local hardware and arts & crafts stores and you’re ready to get your Picasso on. Here are some instructions – and a few tips I learned along the way – to help make your putter a one-of-a-kind birdie-makin’ machine. What you’ll need: Heavy duty paint remover (you can find it anywhere, I got mine from Walmart), small paint brush, Testors enamel paint and applicator bottle/needle (I got mine from Michael’s, fyi download their app, its got awesome coupons) and a few golf tees. Step 2 – This was the most time-consuming part, brush on the heavy duty paint remover to the painted areas. Make sure you wear gloves and even protective goggles, that stuff burns, trust me I know from experience. Step 3 – Wait about 10 minutes to let the paint peel up, then wipe away clean. Step 4 – You may need to re-apply paint remover; make sure there is no paint left on the putter, it will make the finished product that much better. Step 5 – Using the paint applicator, squeeze on your desired paint color, whipping away any excess that spills out over the lettering. Step 7 – Check to see if any areas need more paint (I had to do two layers of paint in some of the deeper-set letters) and add any necessary paint. Step 9 – Using a golf tee, use the tip to scrape away any dried excess paint around the letters to leave a clean, professional look. (Tip of the week – for best results, let it dry overnight then scrape, it’s a tough wait, but you’ll thank me later). Step 10 – Show off your new putter; don’t be shy, use it to drain birdies on your buddies like it’s your job. There’s plenty of trial and error, but I can attest, it gets easier as you go along. And the finished product is well worth it! 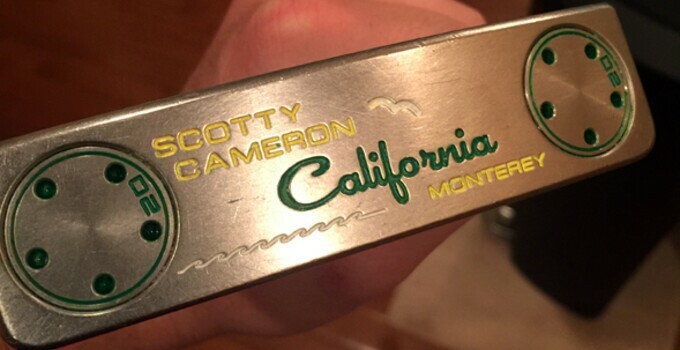 Oh, why the Green and Yellow on my putter? Well, for the 5-0 Green Bay Packers of course, duh. I was born and raised in the corn fields of Racine, WI. The Packers are a way of life, a Sunday afternoon institution. With Aaron Rodgers at the helm, nothing can keep us from … ok, ok, I’ll stop.